Is there a better alternative to Click It? Is Click It really the best app in Simulation category? Will Click It work good on macOS 10.13.4? 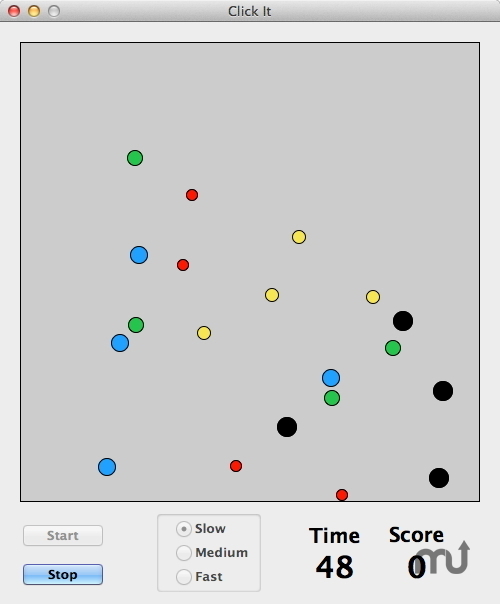 Click It is a fun way to practice your mouse skills while playing a game. The goal is to eliminate 20 targets within 60 seconds by clicking on them. The smaller the target and the faster the target, the more points you get for eliminating it. Each click also reduces the score (cost of ammo) by 10 points. If you eliminate all targets before time runs out, a bonus is added to your score. The bonus is higher for smaller and faster targets. The top ten scores are displayed and saved in the High Scores window. Sound is supported. Click It is freeware. Click It needs a review. Be the first to review this app and get the discussion started! Click It needs a rating. Be the first to rate this app and get the discussion started!